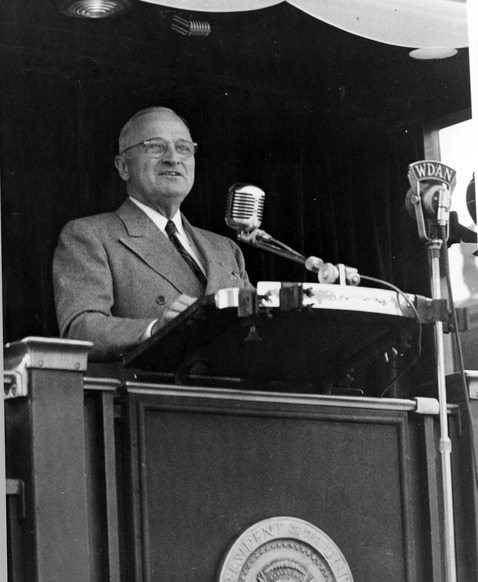 “It is certainly good to be in Danville,” remarked President Harry Truman from the back platform of the Ferdinand Magellan presidential train car on October, 12th, 1948. Danville marked one destination on a 30,000 mile “whistle stop” campaign that many historians now attribute to Truman’s unexpected reelection victory that November. Relive that past form of political participation at Truman Whistle Stop 1948, an interactive all-ages reenactment co-produced with the Vermilion County History Museum Society and complete with 1940s cars, posters, buttons, music, food, a replica Ferdinand Magellan train car, and, of course, Harry S. Truman. And then join us for a conversation with the Harry S. Truman Library and Museum supervisory archivist Sam Rushay and local historian Tim Smith about the political history of Danville and its significance in the 1948 campaign. Sam Rushay has worked at the National Archives and Records Administration for 25 years. He is supervisory archivist at the Harry S. Truman Library and Museum in Independence, MO, where he worked as an archivist from 1993-1997. From 1997-2007, he was an archivist and subject matter expert at the Nixon Presidential Materials Staff at the National Archives in College Park, Maryland. Rushay has published articles about Richard Nixon and Harry Truman. A Columbus, OH native, Rushay earned a B.A. in U.S. History from Ohio State University and obtained a M.A. and Ph.D. in U.S. history from Ohio University, where he wrote his dissertation, “The Farm Fair Dealer: Charles F. Brannan and American Liberalism,” under the direction of Truman biographer Alonzo Hamby. Rushay and his family live in Liberty, MO. Timothy O. Smith, originally from Urbana, Illinois, received his A.B. in History in 1970 and J.D. in 1973, both from the University of Illinois. He practiced law in Danville, IL from 1977 until his retirement in 2010. He settled in Danville upon release from three years of active duty in the Navy Judge Advocate General Corps. Since his retirement, he has pursued his love of history and is currently researching the early lives and careers of Joseph Gurney Cannon and his brother William P. Cannon. Several of his Cannon essays have been accepted for deposit with the Joseph G. Cannon Papers at the Abraham Lincoln Presidential Library in Springfield, Illinois. He also is actively involved in the Osher Lifelong Learning Institute at the University of Illinois, serving as its Board Chair for two years. Danville Area Community College (DACC) has served the community with distinction for more than 65 years, providing a wide range of learning opportunities. Students of all ages can take a class for personal enrichment, retrain to improve employment prospects, earn a variety of career degrees and certificates, or set the foundation to transfer in pursuit of an advanced degree. DACC fosters learning, workforce development, and artistic initiatives, and maintains a rich tradition of excellence in education. The Danville Municipal Band is one of the oldest continuously performing Municipal Bands in Illinois. DLO Musical Theatre began as Danville Light Opera in 1956, making it the oldest musical theatre group in the area. Each year, DLO presents three regular season musicals, two mainstage productions and a dinner theatre production. The organization also presents youth and teen musicals every summer. DLO occasionally produces special programs that can be booked as entertainment for parties and other special occasions by individuals, groups, or businesses. 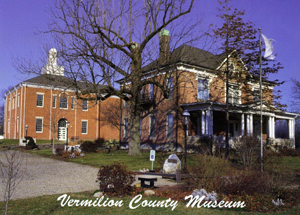 The Vermilion County Museum Society is a not-for-profit organization, in Danville, IL, whose mission is to preserve the historical heritage of Vermilion County, Illinois, including natural history and to establish, maintain, and operate a museum to disseminate knowledge and history of Vermilion county to the public through educational exhibits and programming. The center site highlights the Dr. William Fithian Home, a Lincoln site on the National Register of Historic places.